A Five Week Study of Christian History (In Brief) From Acts to the UCC formation. · Understand how the UCC works to be United and Uniting. · The course is laid out over five weeks of discussion with a scripture theme relating to topics for that discussion along with a short lecture and recap of previous week to provide some guidance of discussion. · Participants are requested to make at least one online note and feedback in an online forum during the week to keep the conversation moving, if the online resource is available. · The first and last meeting are meant to be communion worship meals to encourage the idea of communion, cooperation and return to origins. · The ground rules will be collectively decided in the first meeting but should adhere to value and to respect each other’s views, uniqueness, and diversity. · Keep confidences shared within the group and respect each other’s privacy. We will survey large portions of time and will certainly miss some key points along the way. I assume that you are taking the course because you think that learning about the history of the Church may help deepen your faith. This course and the topics considered may also raise more doubts, even controversy. · Read and prepare ahead of class so that we all can be engaged in the conversation and bring our gifts to share with each other. · Again, respect for opinions is requested and I would ask participants to mutually agree to the agreed ground rules before proceeding. · Given only five meetings, your attendance is expected at each one to be mutually respectful of each other’s’ time commitments. · If you must miss a class, please follow up with others or the instructor for following week activity preparations. · If you wish to share reference work regarding the week’s topic, please be willing to share that reference with participants so that all might be able review the points made. Please let me know how we can help you attend and participate with aids. Week 1: The Early Church During Roman Era. The debates in early church to Constantine. How persecutions influenced the early Church along with the Donatist crisis and Council of Nicea. The scripture here where is God and the institution of communion. Celebrate communion worship with a community potluck meal. This meeting will lay out the rest of the course structure and use the community meal to remember practices of the early Church. Also, Matt Ridley describes the evolution of collaboration that originates and continues through community meals. Then invite people from historically marginalized groups like LGBTQ to share experiences of what is like to be persecuted and how the community managed to rally around hope. The idea would be to share the parallels of history with today and why and how history has impacted our faith. The Middle Ages, focus upon the impact of the Crusades and political controversies surrounding these that impacted Church polity. The scripture here calls upon punishment of Israel for many crimes. Reading suggestions: Gonzalez (Vol 1) Chapters 24, 27, 28, 31, 34-35. After a brief rise with the Roman Empire, the Church is again in crisis mode since the collapse of the Roman Empire causes the collapse of the Church structures as well. We will review the efforts to secure a new home and military power to secure the faith through Charlemagne and the Holy Roman Empire thereafter. Once established, the Roman Church finds challenges in Avignon again. The power of the papacy is exerted via the crusades. The “one [Church] to rule them all” ends with the Great Schism. Week 3: First Generation Reformers: a Crash Course. Scriptural basis and interpretation changes, political interwoven religion where leaders are taking sides and aligning churches with nation and city-states. The scripture shows us one basis for some of the reformers theologies. The group will build a “cheat sheet” and questions about basic ideas. Reformation first generation of Luther, Calvin, Zwingli, King Henry VIII, John Knox, and Anabaptists. What was their basic theology impact? How does the UCC incorporate these? What is the current tradition called? Week 4: Ideas of Religious Freedom, Social Justice in Church, and New Desire to Unite Faith. 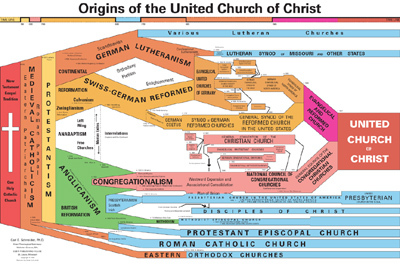 Growth of secularism, Methodism and Pietism as they relate to origins of the UCC. The scripture lessons are a foundation for social justice in the Bible. (Guess and Beckmann, n.d.). A discussion here that focuses upon the fast expansion of traditions based upon piety, social justice raise hope but also tensions with existing traditions of reformers as well as societies outside of European descent, like American Indians. We see systemic problems of bigotry and persecution. We see the growth of public education via the Churches. We see the growth of public health systems via Churches. We see how religion has tied itself to the state, and then the state learns that it is useful to separate itself from theological debates as the debate widens to multiple parties. We see how the UCC came to be through its outreach efforts. Week 5: The Four Traditions that Form the UCC. What is a Covenant? Who Can Have Communion with Us? Where Do We Go from Here? What is the value of tradition or unity? Uniting churches – UCC, UMC, Disciples of Christ. The scripture here tells us more about social justice and the way to eternal life. We celebrate another communion meal like our previous discussion, but hopefully, this time with evolved ideas and views about our work to share. The hope is that-- just like the spread of time for the Church has altered communion, so too has the five weeks with the classmates. I would like to discuss the diagram of the United Church of Christ four traditions into one with how that is similar to the early Church and how that is different. In this discussion, I would like to spend time discussing the prospective visions people have for the Church as well. Our goal this week is to build a list of requests and observations to share with the wider Church (the congregation and the wider Church). · What does scripture mean to you today? · What do you like about the Church? · What would you reform? · How would you invite more people to Church? Have a Bible of your own for reference or borrow one from the Church library. Gonzalez, Justo. (2002). The Story of Christianity, Vol. 1: The Early Church to the Dawn of the Reformation. HarperOne. Gonzalez, Justo. (2002). The Story of Christianity, Vol 2: The Reformation to the Present Day. HarperOne. Guess, J. B. and Beckmann, D. (n.d.). Biblical Foundations for Advocacy. Cleveland, Oh: United Church of Christ. Retrieved from http://www.ucc.org/justice_advocacy_resources_biblical-foundations-for. Ridley, M. (1996). The Origins of Virtue: Human Instincts and the Evolution of Cooperation. New York, NY: Penguin Books. Will you pray with me? Let God guide our senses, our hearts and our ears to receive the lesson given to us. May the words of my mouth and the meditations of our hearts be acceptable in your sight O Lord. You are indeed Our Rock and Our Fortress. but this time it’s the apostles rather than Jesus. Also, thanks to all those who played the role of a mothering influence in someone’s life! I pray it has been and continues to be a positive experience. Before we get into this debate, I would like to tell you a couple stories that might help to understand more about today’s lesson involving good women in my life. My mother is middle child of 17. How we came to understand one of her well-worn quotations. from our young ages, we would go stay with Grandma and Grandpa at their farm for a spell. often get pulled into field work. filling the house full of wonderful smells of baking, canning and cleaning. because they would grow and make everything they needed from the farm. So, her day was usually busy with hard work as well with all this cooking and cleaning. and you could smell the rich jams, cut garden vegetables, warm breads and often fried chicken for lunch. The kind where you must flick your hand dry given so much juiciness! mmm mm mmm. We would get back later that evening of work to a table ready for supper. We always say grace before the meal. a neighbor or another uncle might visit. would quickly find another plate setting and invite them to supper. She would not turn someone away. In Acts, we observe the beginning of the Church through the Apostles: thus, the Apostolic Church. put in charge of the work and mission that Jesus gave them. Apostles have been busy baptizing and celebrating communion with more and more people. North Africa, Ethiopia, Persia, throughout the Roman Empire, and beyond. Thus, the message of Jesus is spreading and fast. They witnessed, they believed and they felt the grace of Christ. Then, we get to this text. There are several things happening in this lesson today. They call a council with the Apostles in Jerusalem. In this council, they again want to challenge the message professed by Jesus. They want to question who can be included in God’s “plan” and salvation. They think that they can win over the Apostles, since Jesus was not there to debate them. Essentially, they want to use tradition and symbols to excuse people from knowing God. they do not think there is room for one more. They think this church is growing too fast. They think it should not extend to communities outside of Israel. It is like they think God cannot possibly be big enough for everyone. This brings me to a story involving my mother. looked at the calendar ahead of us. We found one that also landed upon my parents’ anniversary. Before we made the date, we went to visit with my parents to talk about this. We did not want to be rude or overly presumptuous about their special day. These stories of sharing contrast with what the Pharisees want. could have taken lessons from the two great women in my life. Likely there were some good women involved here too! all are welcome to a relationship with God. The Apostles want to share the experience of God with anyone willing. Like keeping God in a box tucked away except for special occasions. Why deny what we are clearly called to do? The Church is as big as God is. or if your home is in the right neighborhood. when you walk with Christ. Jesus is here among us today and we are challenged to make room. We are tasked to be bear witness to the truth of Christ. We are challenged to share what little we have. We are reminded that we have so much! There are no exceptions to the mission of compassion, only invitations. The grace of God is for those who seek and desire wholeness of life. That is core to our faith! We extend that grace when we open our arms and hug life. We can live and share these moments of grace. Yes, Christ came to fill all our hearts with hope and compassion. Whose day can you be making better? Is there room for one more in your life? Let that grace fill you today and share it with everyone around you!